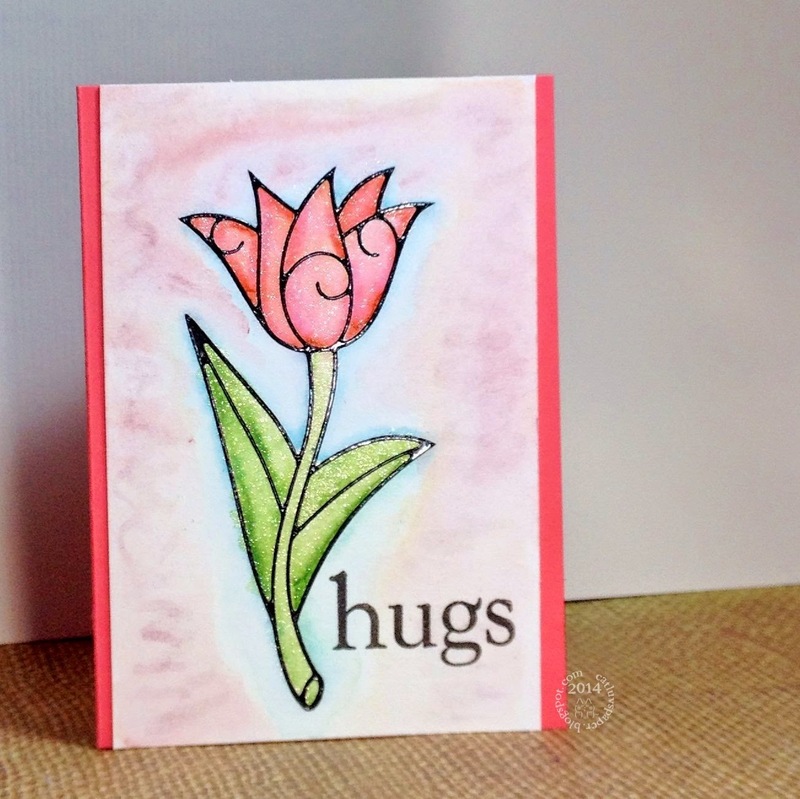 I made this card prior to taking Online Card Classes Watercolors for Card Makers. I was just playing around with some striped backgrounds. 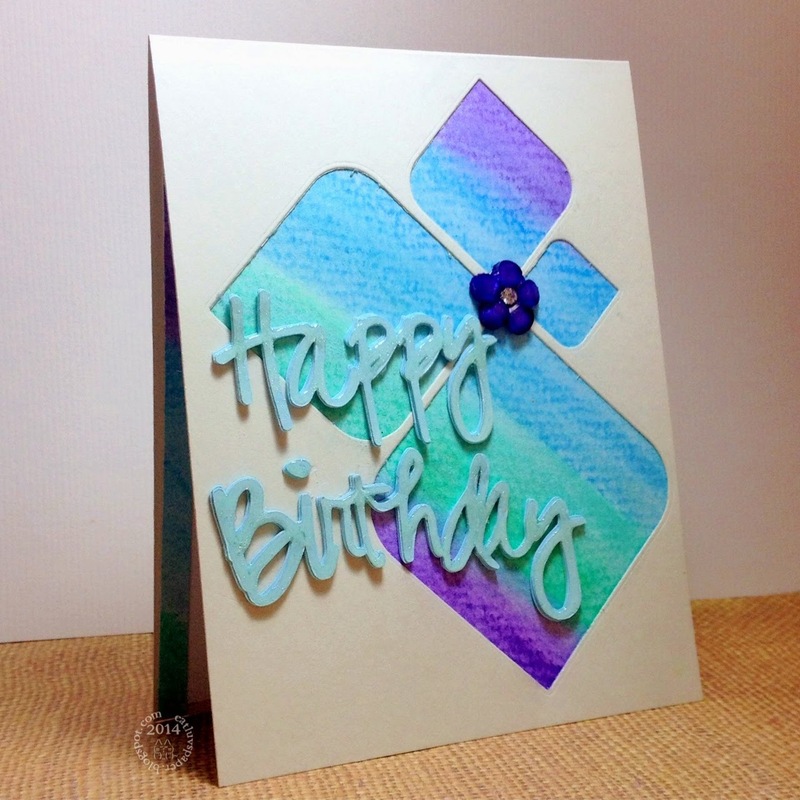 I have had these rounded diamond dies forever, and I finally used them to make this birthday card for Michele. The sentiment was made using my Silhouette Portrait, and a font I had on my laptop. I welded the letters together and cut the words out several times to stack it. I then covered the letters with glossy accents. A scrap of the water colored paper is also on the inside panel. Have a very happy birthday Ms Michele! I spent most of June in California visiting and caring for my Dad and going to my Godson's graduation. My Dad had minor surgery and scheduled it for the time I would be there. It went well and he is well on the way to complete recovery, though I am sure he would not have minded me staying a few weeks more. I think he got used to the home cooking very quickly. I did spend a day stocking his freezer with meals he can take out and warm up, he definitely appreciates that. My Dad decided he was ready to have a cat again. The house has been empty this last year, with no cat around. He actually decided to get two kittens, so they would have playmates. The first one is a bit of a wild one, he was abandoned by his mother. His name is Digger, he is quite the excavator in the litter box. About a week later Jack came to us. He was out of a house cat's litter and is the most sweet tempered kitten. 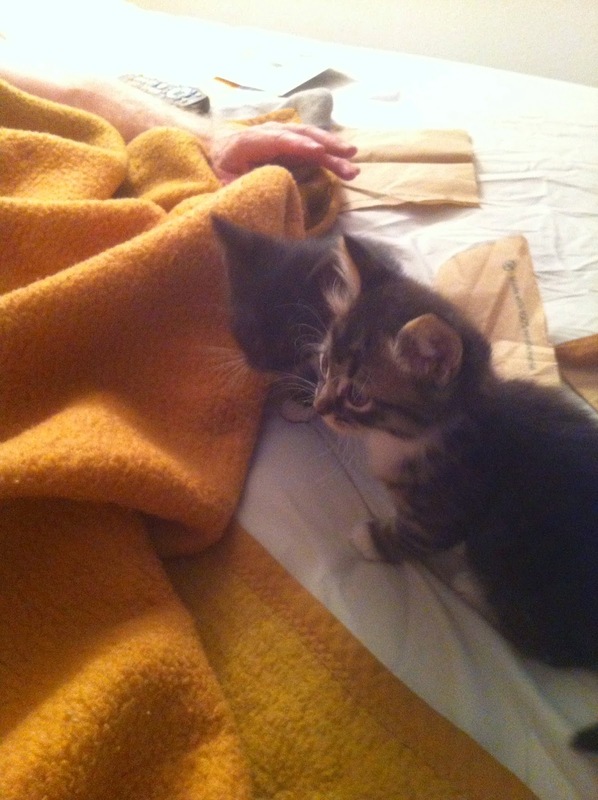 We introduced the two to each other by placing them on opposite corners of the bed. They met in the center, sniffed each other out and became fast friends, playmates, fighting foes, and sleeping buddies. 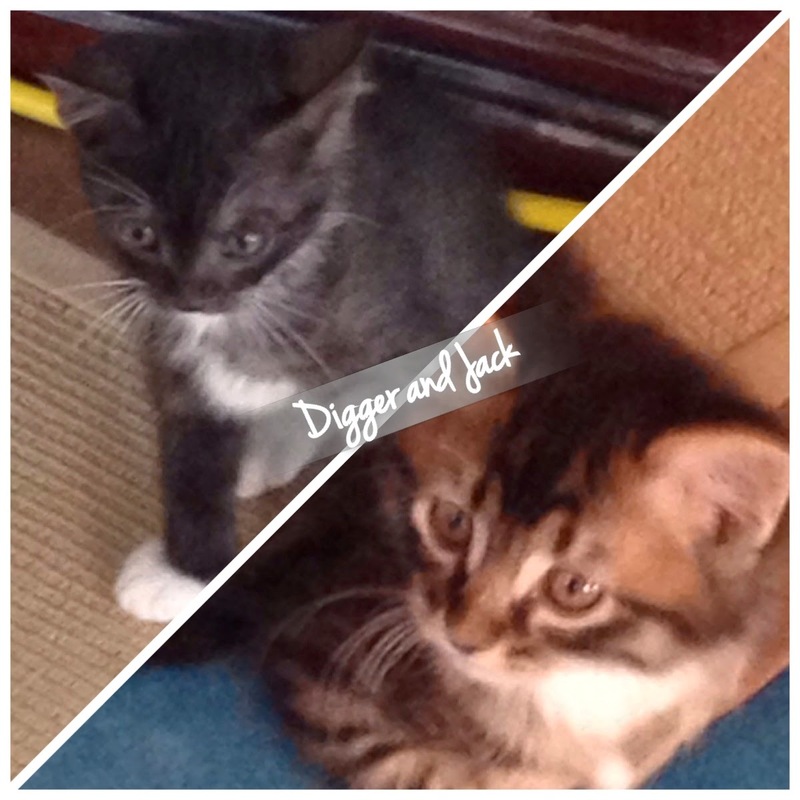 Jack is about a week to 10 days older than Digger, and he is doing a great job of socializing Digger who was a little skittish. 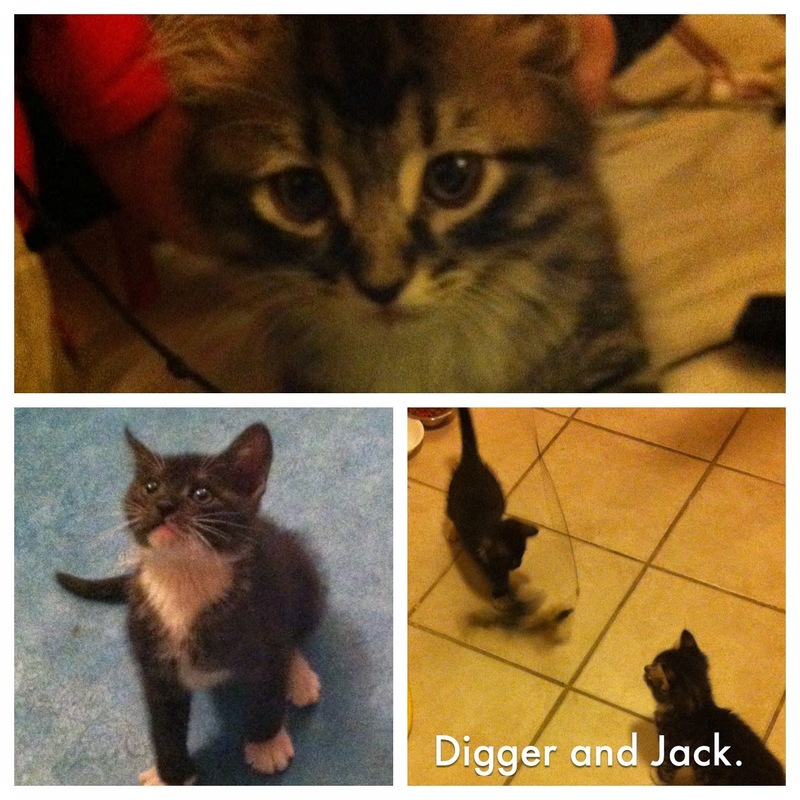 Jack has the sweetest face right now, but Digger is going to be a gorgeous cat when he gets bigger. Their eyes are still that cloudy shade between blue and green. I had a tough time saying goodbye to my Dad, but thanks to the Iphone we keep in touch with Facetime and I even got to see the kittens climb the cat tree for the first time (its about 5 feet tall). 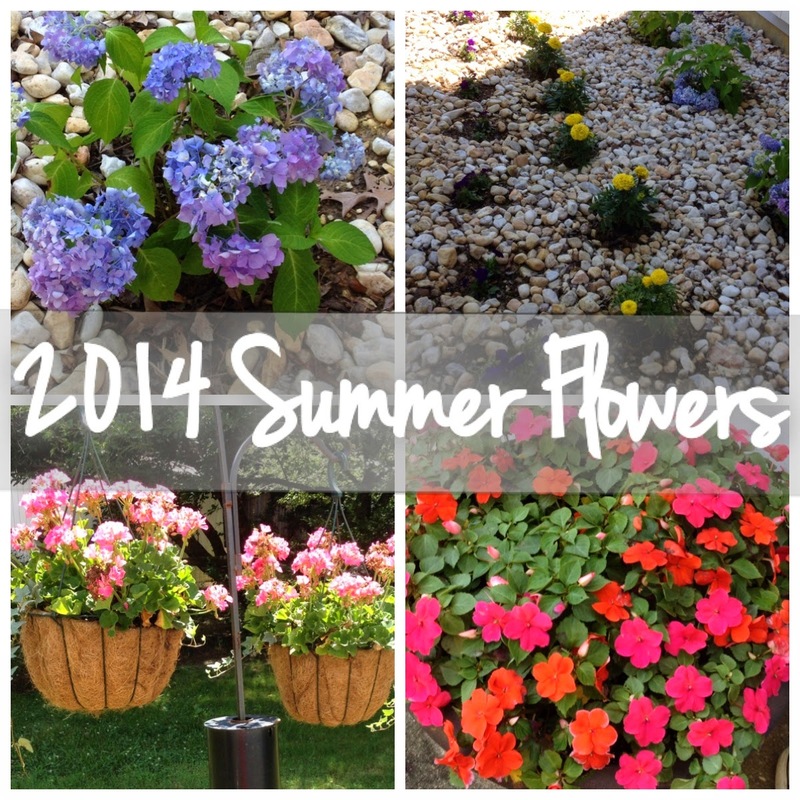 When we returned home to Maryland, our garden flowers were looking great. I wondered how they would fare with us being gone, hubs for 10 days--me for 3 weeks...but they were a welcome sight when we pulled into the drive. The hanging geraniums just exploded in bloom. My impatiens really filled out and our beleaguered Hydrangeas from last year (black soot fungus) really bounced back with gorgeous bloom clusters. Our marigolds and petunias are thriving as well. Back to cards in the next posts, thanks for stopping by. I love this Penny Black stamp, I recently added it to my stash. I can see a lot of cards from this set. I used Wink of Stella markers to color the image. 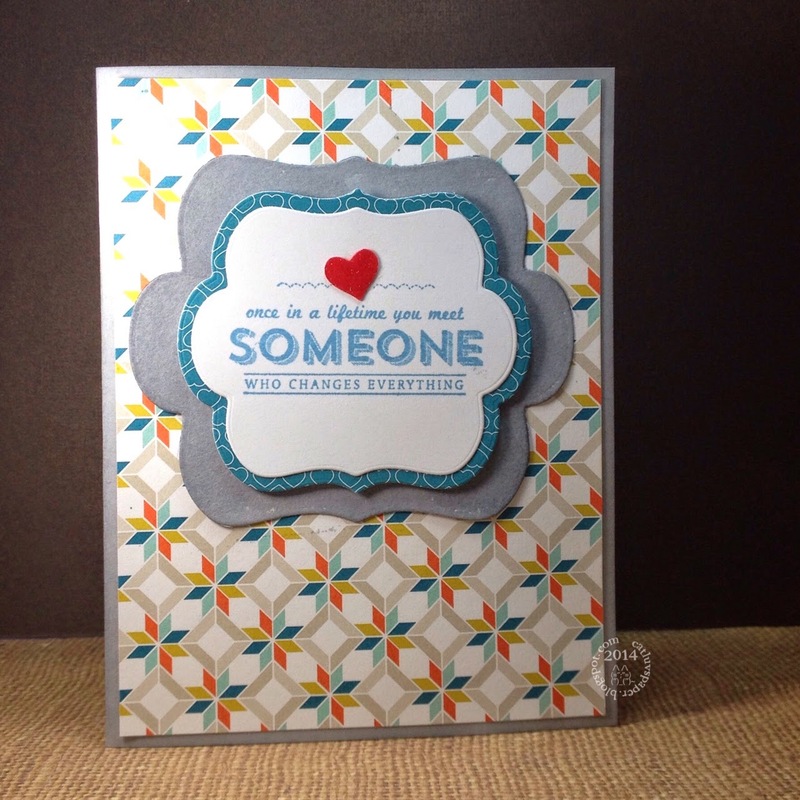 The sentiment comes from the Hero Arts set CL586. I tried to get a bit of the glitz in the picture. I added enamel dots for some texture, and a strip of green cardstock on the left side for some contrast and balance. My Godson graduated High School this year...wow...it hardly seems possible that so much time has passed. He is smart, handsome and has a great head on his shoulders. I am proud of his accomplishments, and wish him continued successes as he embarks on his college years. Hubs and I traveled to California to attend his graduation and visit my Dad. 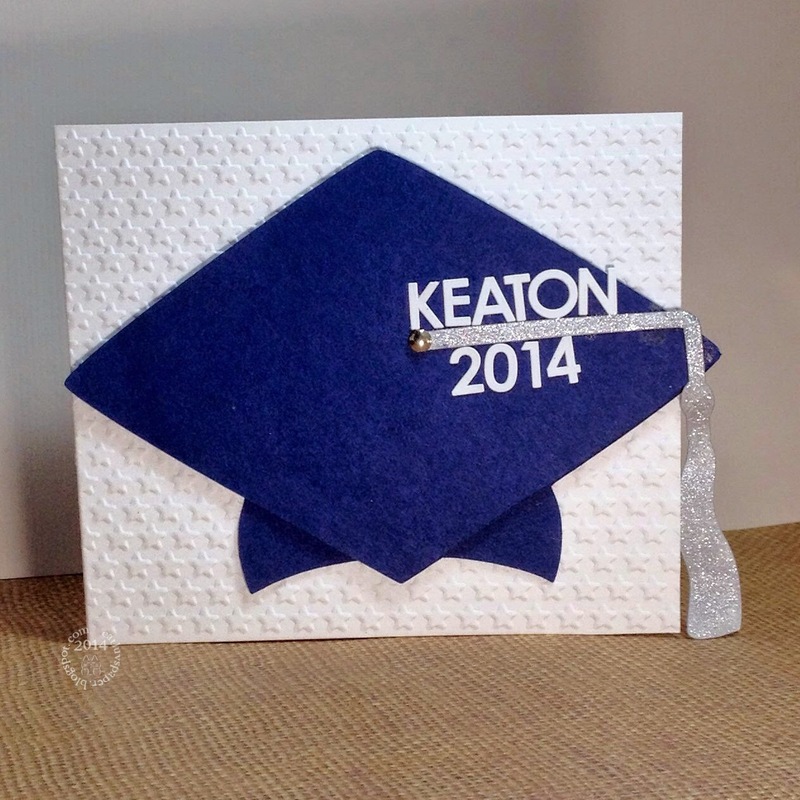 For his card I chose a star embossed backdrop for the mortarboard and tassel in school colors (image from the Silhouette Online Store). Sticker letters from Kelly Purkey. I picked up this die on a whim while on a day trip with hubs. I love flowers, so they always pull at me. I pulled out the Be Creative tape and the Glitter Ritz glitter and a couple Spectrum Noir markers. 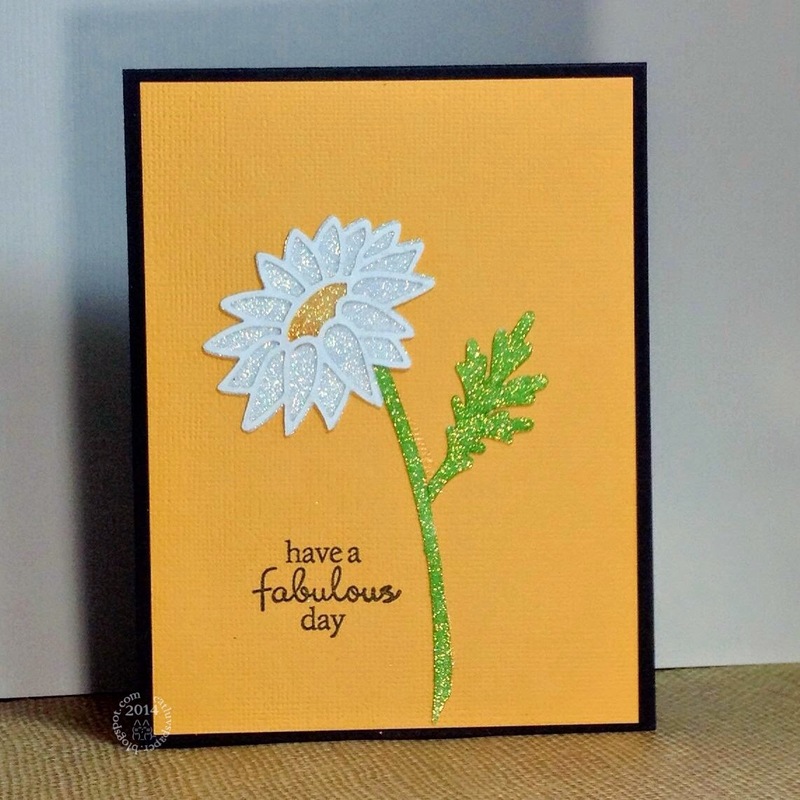 I glittered the daisy background, center, stem and leaves, leaving the petal outline plain. I colored the center, stem and leaves. 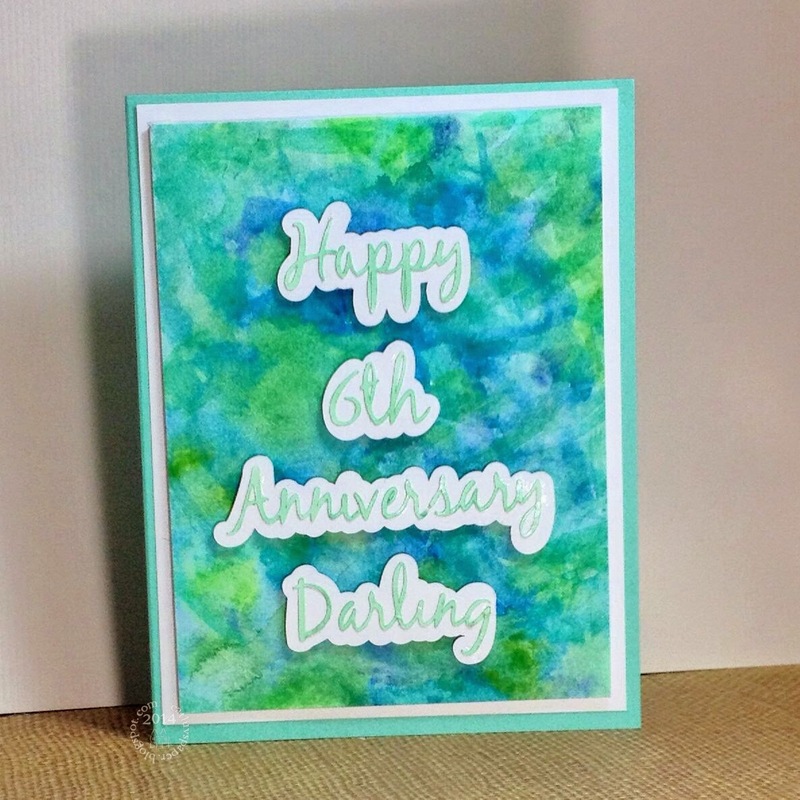 I so love these glittered cards! Sentiment is from Hero Arts Butterfly and Flowers Set CL750. The die is 901-Daisy from Elizabeth Craft Designs. Thanks for stopping by, and have a FAB day! On our recent outing, I also picked up some Elizabeth Craft Designs stickers. These stylized tulips did not look too appealing, but I though I'd give them a shot. I am SO glad I did. This is a mini card, the image itself is about 3.5 inches long. This is a mini card 3 by 4.25 inches. I started with 1/2 of a Distress Watercolor sheet (yes, I am addicted to this stuff!!) I pulled off the vinyl sticker from the sticker sheet (6 main images for about 2 bucks) and placed it UPSIDE DOWN on my work space. Because it is a vinyl sticker it can become pulled out of shape when placing on your card surface. I then placed my paper over it lightly tapping the center, I turned it over to check placement...It took 3 tries to get it to the right spot. I used distress markers to color the flower Fired Brick and Mowed Lawn , and blended out with waterbrush. The image was outlined in Tumbled Glass and then in Victorian Velvet to create the back ground. I like the bit of glow the blue provides. I dabbed on wink of stella (thanks for the tip-Kristina Werner) to get some shine and I think I captured a bit of the shine in the photograph. 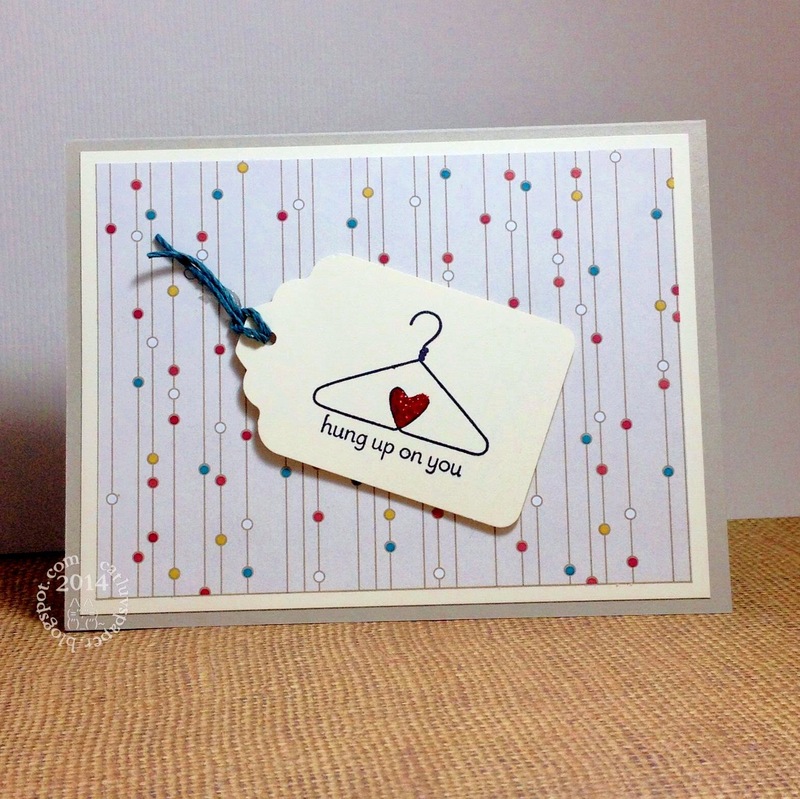 The sentiment came from the Hero Arts set CL567 - You and Me. I used super sticky double sided tape to adhere the panel to the card base. Next time I will heat emboss the sentiment, to make it match the vinyl sticker gloss. Hubs and I both have wonderful fathers. I always make similar cards for them for Father's Day. 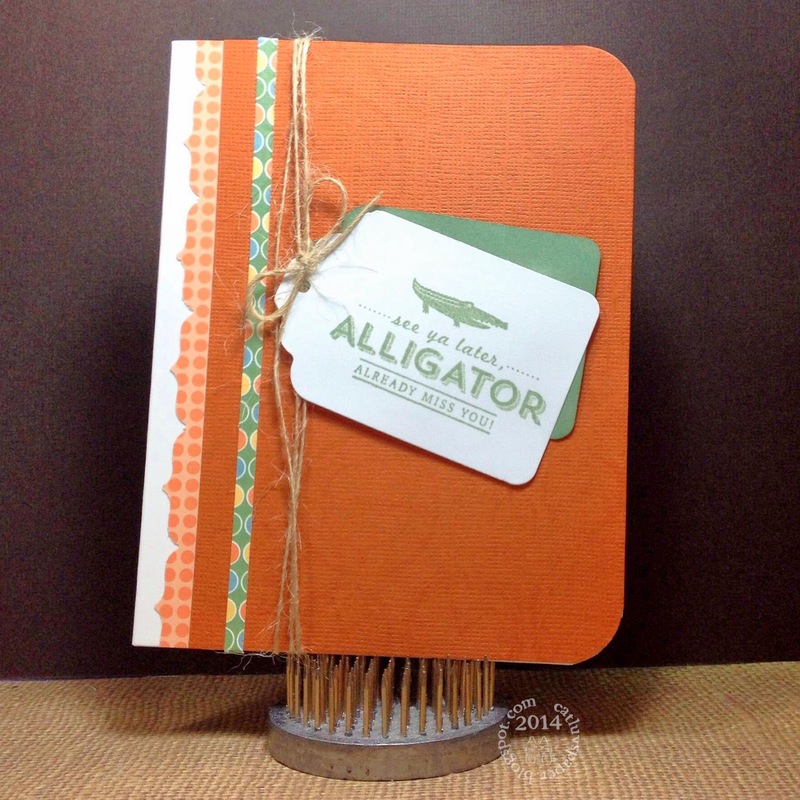 Here is this year's edition, featuring a watercolor panel to hold the stamping. Hoping you are able to spend some quality time with the Father's in your life. 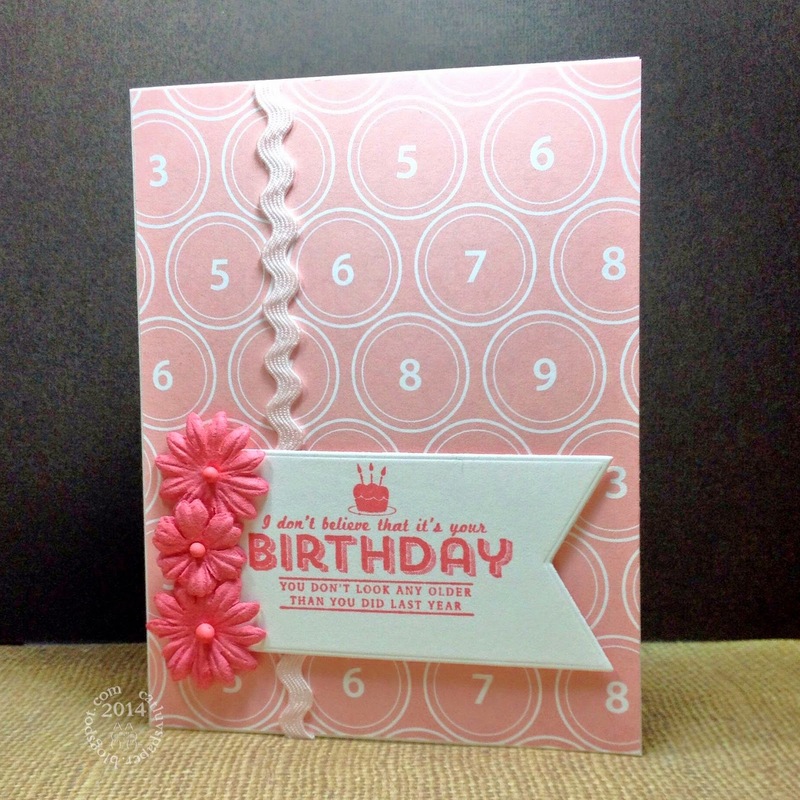 Stamps and patterned papers by Stampin Up. More cards for hubs while I was away. They are silly punny ones from Stampin Up. He likes a simple card and these are simple. The blender and the lava lamp both have glossy accents on them to give them a bit of a liquid-y feel. Hope you are all enjoying the early June weather. Thanks for stopping by! A quick birthday card to have on hand. Seems like birthdays are sneaking up on me this year. I am not as on the ball as I used to be with them. 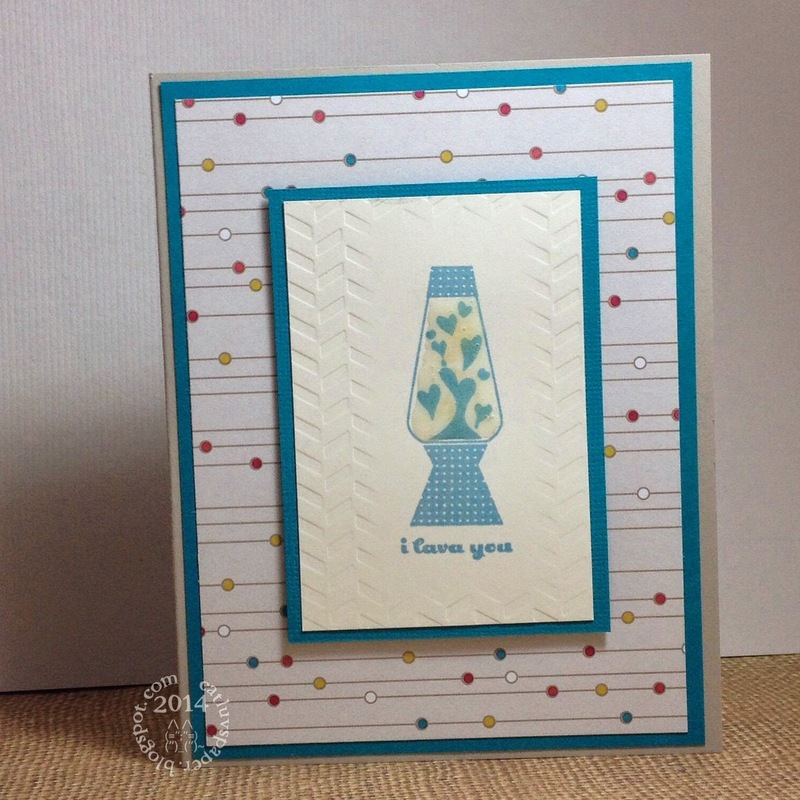 Stamp and papers by Stampin Up. Another card sent to hubs while in California. Stamp by Stampin Up. That's what meeting hubs did for me! 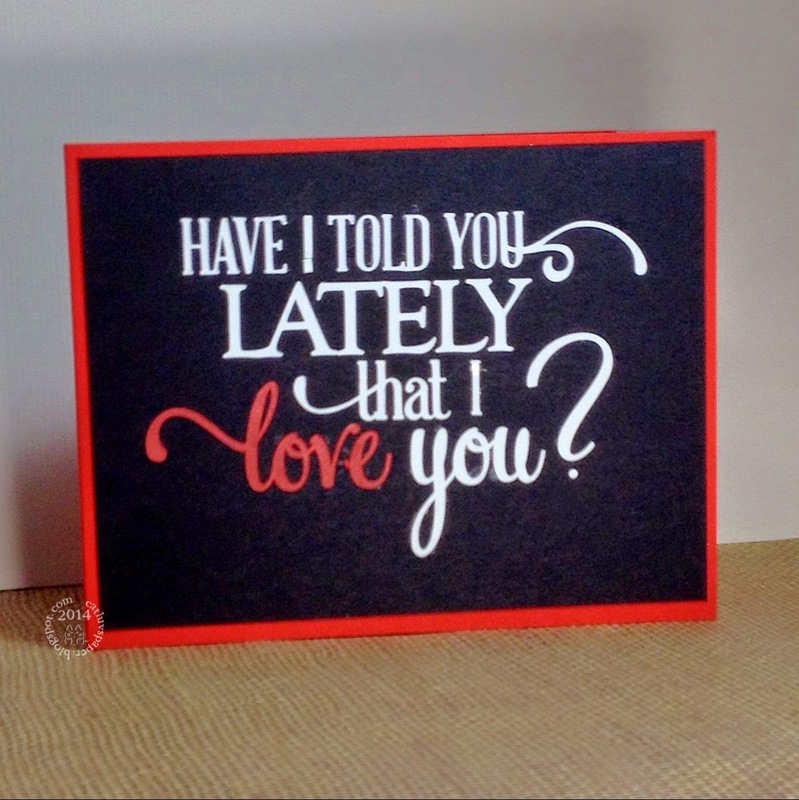 Another card sent to hubs! Embossing folder by Darice, Stamp by Stampin Up. While in California visiting, I made and sent Hubs some cards. I wanted to remind him of our courtship, I used to send him a card weekly. That was before I was making them. 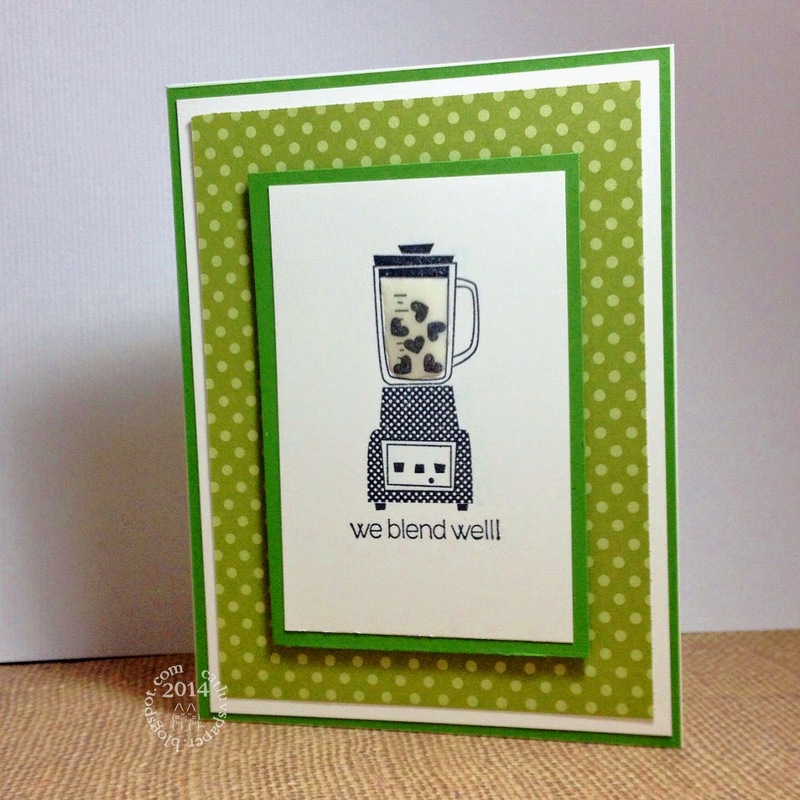 The next few posts feature a stamp set from Stampin Up. Over our Easter break, hubs (mostly) and I had the chance to relive our college days...well not in the way you might think. Our niece had asked if either of us recalled our Chemistry from college. She was prepping for exams and was looking for input. Hubs completely ROCKED it. I was so impressed. I was okay for the first bit, but then it was just lots of air swooshing over my head! Chemistry was more than 30 years ago for the both of us, so his recall and understanding of the concepts just blew me away. We just heard that the session paid off, and I made this card to send to our niece. 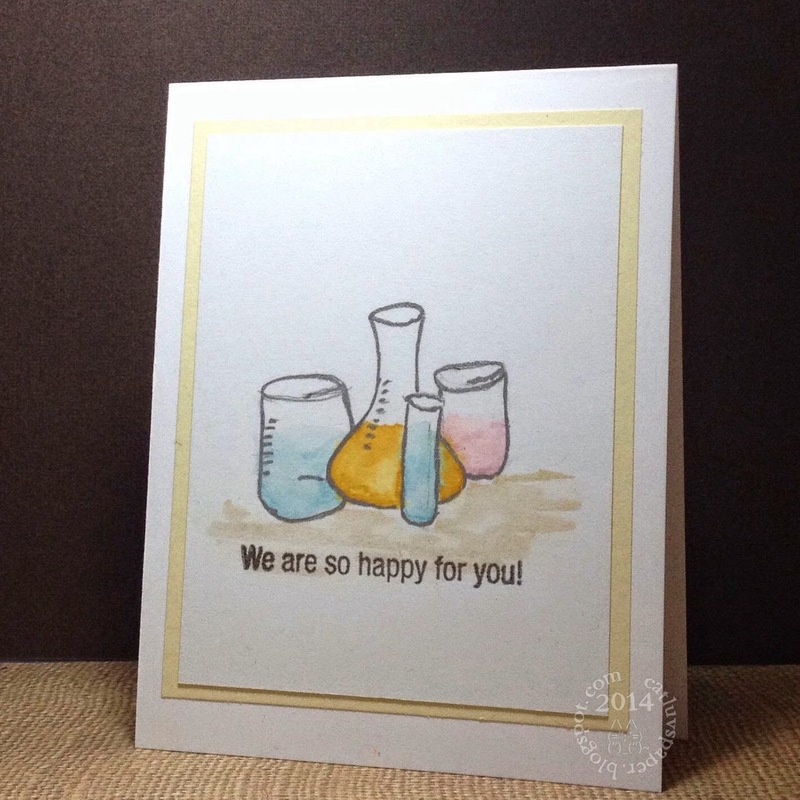 I have limited drawing skills (they usually involve rulers) and I found some images online of beakers, flasks, and test tubes. I traced them from my Ipad with the screen super bright. I added some distress markers and blurred it out will some water. The outlines were then traced again with a silver pen. 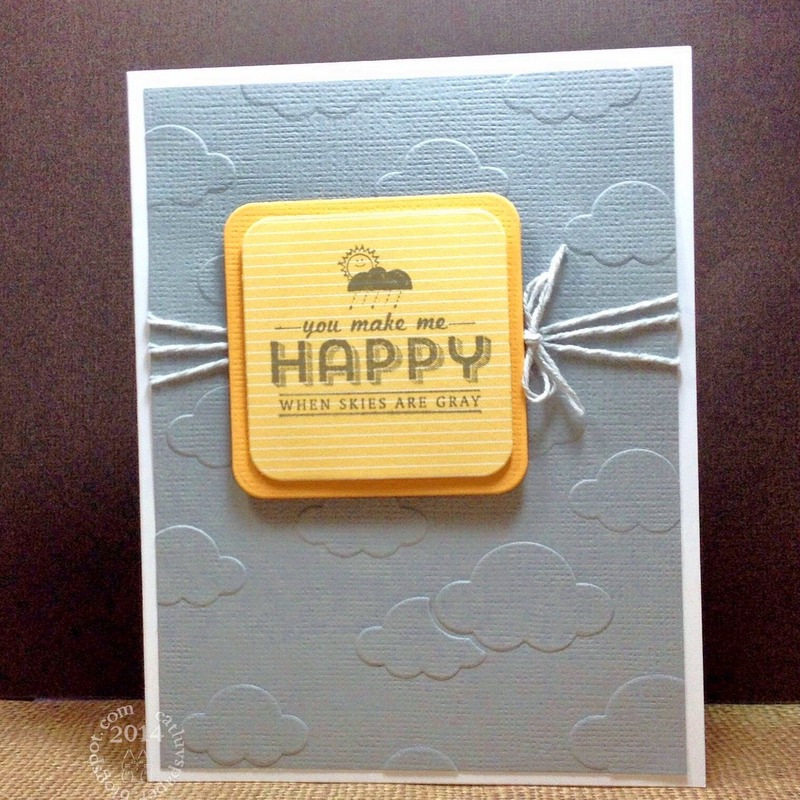 Sentiment is from Simon Says Stamp. Hubs and I are celebrating our 6th wedding anniversary. I usually give hubs more than one card. We also give each other a letter we have written reflecting on the last year. I have to say, Hubs usually ROCKS the letter, so I do look forward to them. 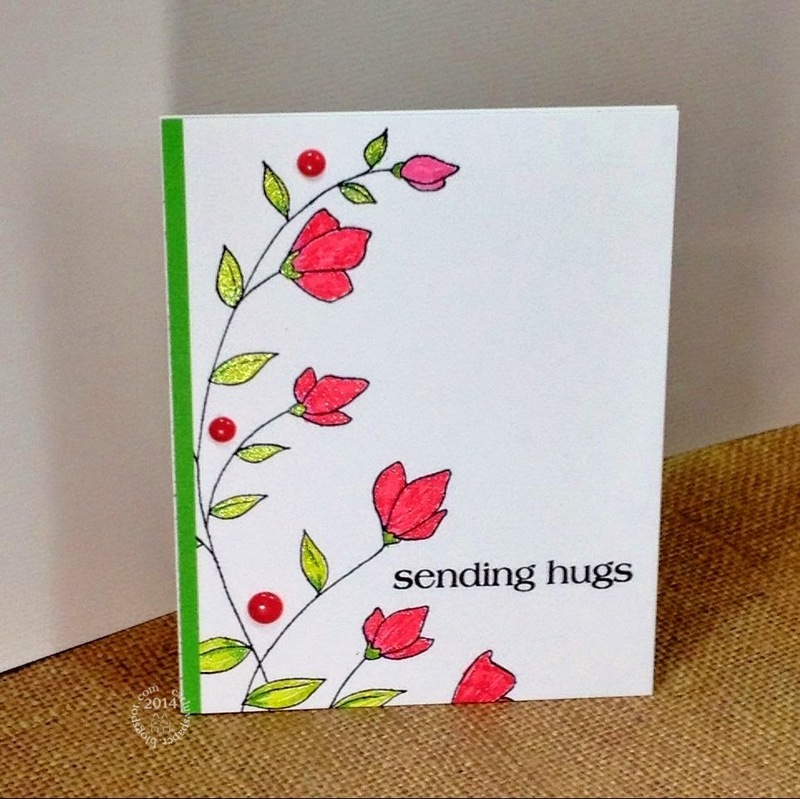 Two of my cards will have a sweet sentiment, the third will house my letter. 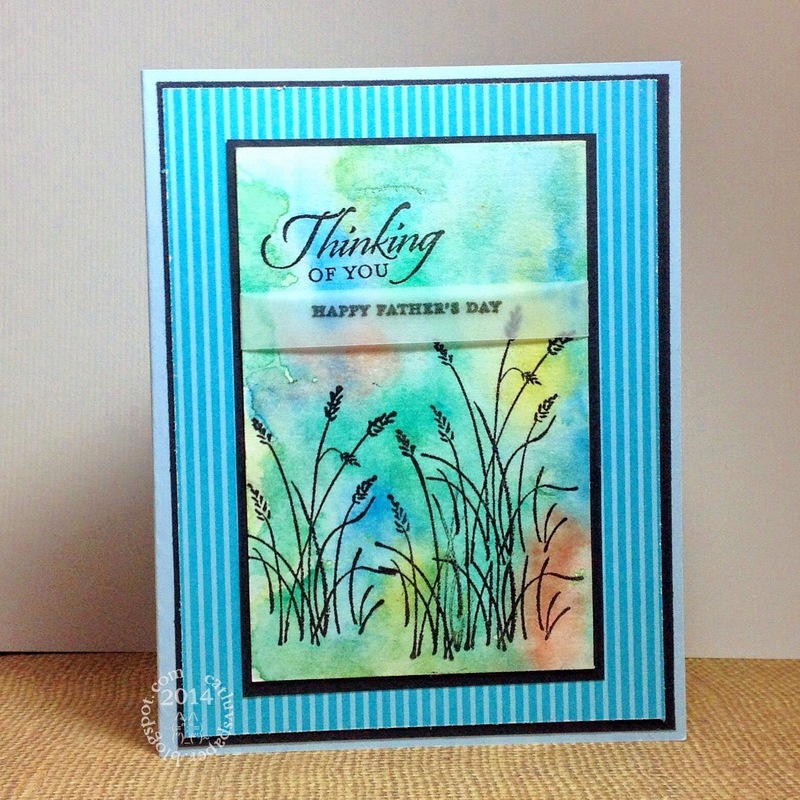 I made the sentiment for the watercolor card using my Silhouette Portrait, and the second card has another sentiment from the Silhouette library. 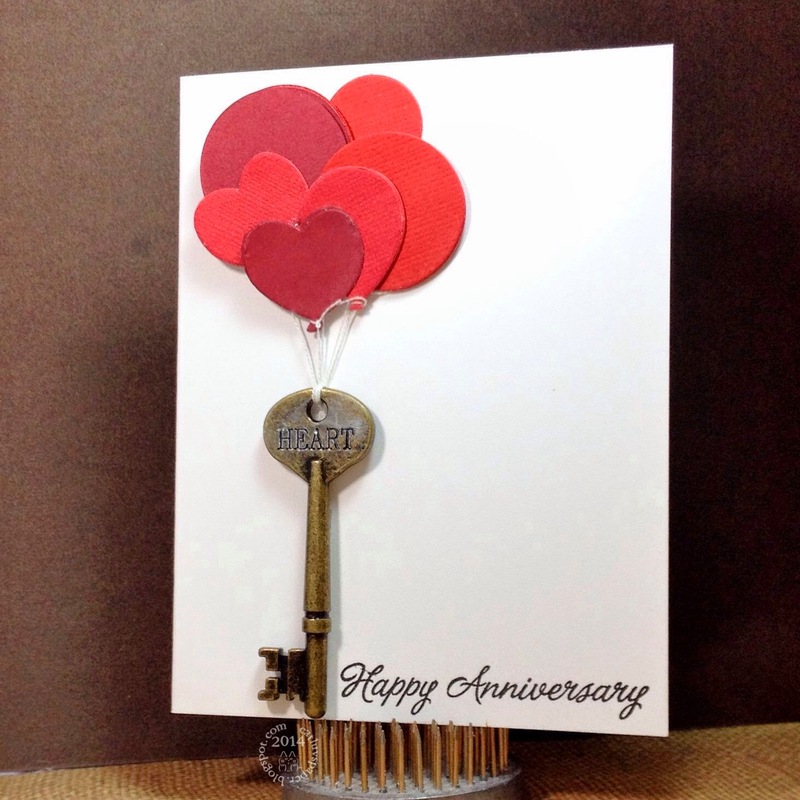 The third card features die cuts from Paper Smooches, Sentiment from Hero Arts and a Tim Holtz key.